Tequila is doing well. She is 8 months old now. Time flies, it seems like just yesterday, she was a tiny little slip of a thing that fit in my palm. She is still pretty small at just under 4 pounds. She was scheduled for her spay and to have her 2 remaining baby teeth removed, but I decided to pull blood work on her as a precaution. I never pull blood work on puppies prior to spay or neuter and we have never had problems, but we have had a bad year this year with losing 2 dogs in close proximity and I could not bear the thought of something happening to Teq under anesthetic. My vet, who is absolutely wonderful, is used to my bouts of irrationality about some things and thought it was not a bad idea to pull the blood work on her since she is a Chihuahua and while she has not shown any symptoms of having a shunt it’s something that can happen in the breed and we still aren’t sure what the “regurg” thing is about. 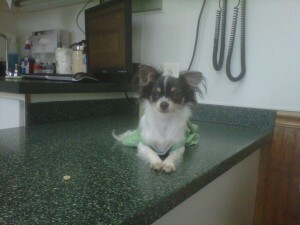 We also took Mr. Turner in for his yearly check up and blood work. Her next words were: “Now don’t panic,” so I knew something came back with Teq’s liver and I was right. It actually wasn’t that bad. Her ALT was a bit elevated, but the rest of her blood work was great. 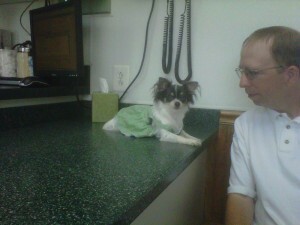 Her blood sugar was also a bit high, which is kind of strange, but she wasn’t worried about that. I can’t recall now why she said that can happen, but it wasn’t high enough to worry about. She doesn’t act like a shunt dog and with a shunt you normally see other blood values off, so we do not think it’s a shunt. Sometimes a parasite can cause ALT to be elevated, so we postponed the spay and did a course of wormer and will do another blood test and see what her values look like at that point. If it’s still elevated, then we will have to do something more “aggressive” like x-rays and a bile acid test. As it turns out, it’s probably good we waited because Teq went into heat the next day so I’m sure that would have been an extra hard spay once she got in there and everything was all swollen up and yucky from her being in heat. 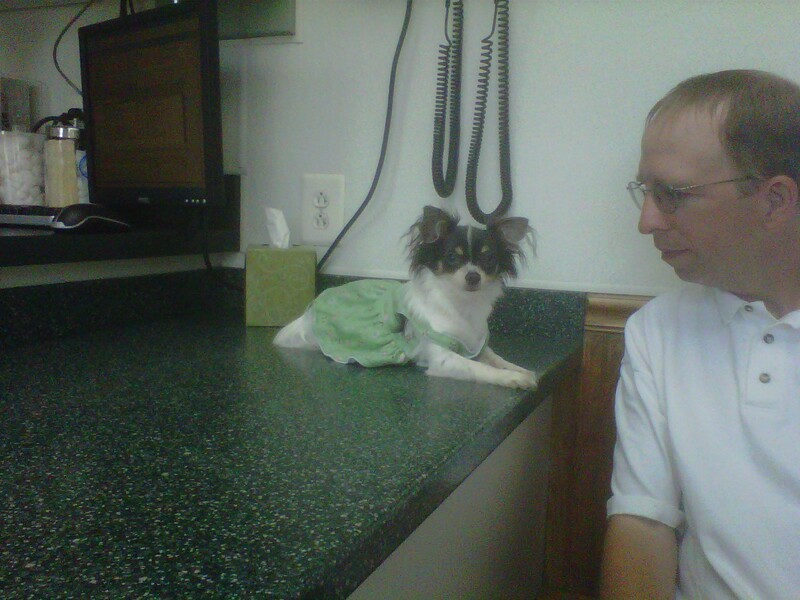 Here is Miss Teq at the vet, in one of her custom made dresses from The California Chi. These are such a big hit and they are so well made. Teq really loves them as well.